Book Description Arthur C. Clark, creator of one of the world's best-loved science fiction tales, revisits the most famous future ever imagined in this NEW YORK TIMES bestseller, as two expeditions into space become inextricably tangled. Heywood Floyd, survivor of two previous encounters with the mysterious monloiths, must again confront Dave Bowman, HAL, and an alien race that has decided that Mankind is to play a part in the evolution of the galaxy whether it wishes to or not. Editorial Reviews From Library Journal Fifty years after the alien message forbidding humans to approach the moon Europa, an expedition to Halley's Comet is forced to violate the prohibition in the name of mercy. 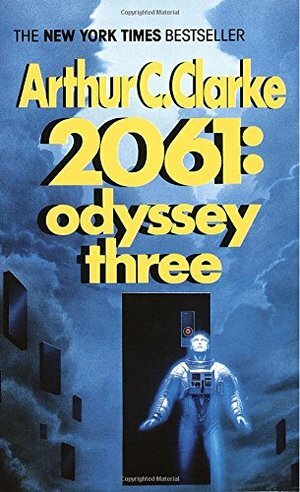 Though lacking the lyrical prose of The Songs of Distant Earth , Clarke's latest addition to the story begun in 2001: a space odyssey will entertain fans of the "black monolith." For large sf collections. JC Copyright 1987 Reed Business Information, Inc. --This text refers to an out of print or unavailable edition of this title. From the Inside Flap Arthur C. Clark, creator of one of the world's best-loved science fiction tales, revisits the most famous future ever imagined in this NEW YORK TIMES bestseller, as two expeditions into space become inextricably tangled. Heywood Floyd, survivor of two previous encounters with the mysterious monloiths, must again confront Dave Bowman, HAL, and an alien race that has decided that Mankind is to play a part in the evolution of the galaxy whether it wishes to or not. Dr. Heywood Floyd, the hero of 2010, has suffered an accident and has become a permanent resident on an orbital space hospital. His grandson Chris works aboard the spacecraft Galaxy and has not seen his grandfather in years. At the age of 103, Floyd is chosen as one of several "celebrity guests" to travel aboard the privately owned spaceliner Universe for the first-ever human landing on the surface of Halley's Comet as it makes its periodic pass through the solar system. The craft lands on the comet and the crew explore its surface and its caves. On Ganymede, Rolf van der Berg, a second-generation Afrikaner refugee, studies data on satellite surveys of Mount Zeus and forms an astonishing thesis about its nature. He communicates his discovery to his uncle Paul Kreuger, and he is invited to join the crew of the spacecraft Galaxy for its flyby of Europa. As Galaxy nears Europa, Rosie, a stewardess, attempts to single-handedly hijack Galaxy, forcing it to crash into Europa's ocean. Failing in her (unexplained) plan, she commits suicide, and the crew of Galaxy is now stranded on their floating spacecraft. Observing the burgeoning aquatic life forms of Europa, the crew pilots Galaxy to an island which they name Haven. Universe is forced to abandon its exploration of Halley to rescue Galaxy. After siphoning water from Halley's vents to refuel, an idea conceived by Universe's navigation officer and advanced by Floyd, Universe heads directly for Europa without returning to Earth first. During the flight to Europa, the celebrity guests discuss the mystery surrounding Dave Bowman and the monoliths, and whether they would be allowed to land on Europa to rescue Galaxy’s crew. Floyd follows a suggestion that he simply try to call Bowman on the radio, and that night has a strange dream in which he sees a small monolith (referred to as a minilith) floating at the foot of his bed. On Europa, Van der Berg and Chris Floyd take the shuttle William Tsung (nicknamed Bill Tee) to study Mount Zeus. Near Mount Zeus, van der Berg relays the message "LUCY IS HERE" to his uncle Paul. It is revealed that Van der Berg's hypothesis, now proven true, was that Mount Zeus is one huge diamond, a remnant from the core of the exploded Jupiter. (The novel explicitly identifies the source for this idea, and for Van der Berg's code: a 1981 article in the journal Nature hypothesizing that the cores of Uranus and Neptune are diamonds the size of Earth; the article is subtitled "Diamonds in the Sky?" in reference to the Beatles' song "Lucy in the Sky with Diamonds".) The revelation about Mount Zeus explains how Van der Berg got onto Galaxy and why Rosie tried to hijack it: both the rulers of the USSA and the exiled Afrikaners are concerned about what might happen to the world diamond market if a vast mountain of diamond was discovered. Travelling further, the two men find the wreck of the Chinese spacecraft Tsien (which had crashed on Europa in 2010), which has been completely stripped of its metals, and then find the enormous, 3 km (1.9 mi) long monolith lying on its side at the border between the dayside and nightside, dubbed the "Great Wall". Beneath it is a town of igloo-like dwellings, but the inhabitants are not in sight. There, Chris sees an image of his grandfather, who appears to Chris in the same way that Bowman appeared to Floyd in 2010, and tells him that the Universe craft is coming. Universe rescues Galaxy's crew; they are brought to Ganymede, where they watch as Mount Zeus, which has been steadily sinking, finally disappears beneath the Europan surface. Kreuger writes a follow-up article for Nature, stating that Mount Zeus was a mere fragment of Jupiter's core and it is almost certain that many more such large pieces of diamond are currently in orbit around Lucifer. He proposes that a program be initiated immediately to collect these enormous quantities of diamond and put them to use. In an epilogue, set in the year 3001, the original monolith discovered on the moon in 1999 has been placed in the plaza of the ancient United Nations Building. Humans have found more quantities of diamond from the former Jupiter and have used it to create space elevators and an orbital ring connecting them, as suggested by Kreuger. (This idea will later be a central concept in 3001: The Final Odyssey.) Suddenly, Lucifer's light begins to fade, and the Monolith awakes.